What to make of Mirror Mirror? The first of two Snow White films this year (the downside of public domain properties), it takes what appears to be a decidedly lighter approach than its doppelgänger Snow White and the Huntsman. (That one stars Twilight’s Kristen Stewart, so I predict it will involve sulking.) For now, we must make due with Julia Roberts as The Queen and evil stepmother. The larger plot points remain in place. Snow White (Lily Collins) is banished from the kingdom by a jealous queen who fears her beauty. She is taken in by a band of dwarves and there is, of course, a prince (Armie Hammer). However, where this version differs is in tone. The film has a distinctly contemporary attitude that does work, albeit intermittently. Snow White, capable and clever, is not your clichéd princess…which of course has become a cliché all its own. The Prince is vain and slightly bumbling because, you know, we can’t have our daughters being taught to wait around for princes anymore. Although I’m not quite sure what role model we’re now providing for our sons. The actors portraying the dwarves have wildly varying degrees of acting skills, but I’m sure it’s difficult to find 7 people with dwarfism who are 1) willing to play dwarves and 2) gifted actors. (And let’s not kid ourselves; we’ve been spoiled by the superb work of Peter Dinklage.) That being said, they generate the biggest laughs in the film and, thankfully, those laughs never come at their expense. While there are delightfully twisted little moments that hit the mark, they are few and far between. Unfortunately when the movie isn’t in delightfully twisted mode, it’s rather listless. Compounding problems is the fact that the actors don’t all seem to be on the same page as to just what kind of picture they’re trying to make. Some appear to be making a straight ahead kids film, while others seem to have wandered in from a Tim Burton movie. But the film is visually striking and, mercifully, isn’t in 3D. It’s neither as good as I hoped, nor as bad as I feared. In the end, it’s a sweet but thoroughly forgettable children’s film. 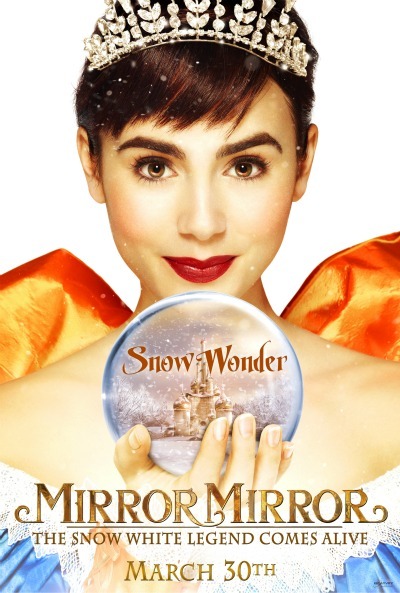 On a scale of 1 to 10, with 10 being The Princess Bride and 1 being The Charmings, Mirror Mirror gets a 6.